When marriages, friendships, and families come undone, to what lengths do we go to keep it all together? That question lies at the heart of Brendan Mathews's buoyant and unforgettable debut story collection. A young mother watches as her desperate husband, convinced a hidden poison lurks inside their walls, tears their home apart. Two journalists bruised by romance and revolution, one a survivor of the Bosnian war, trade tales of lost lovers. A father and his sons haggle over the family business during a high-stakes round of golf. And a lovesick circus clown tries to explain the accidents that bound him to a trapeze artist and a witless lion tamer. If Mathews's novel The World of Tomorrow was an "outsized" entertainment, a "big, expressive debut" (Wall Street Journal), then This Is Not a Love Song, two stories from which have been included in The Best American Short Stories, is glorious proof that he excels equally as a miniaturist. 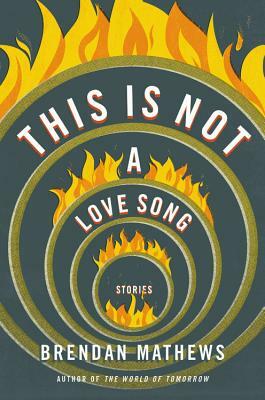 From rock-star flameouts to church burnings to ordinary people trying not to fall out of love, these stories are packed with vivid detail, emotional precision, and deft, redemptive humor. Brendan Mathews, a Fulbright Scholar to Ireland, has published stories in Glimmer Train, the Virginia Quarterly Review, and the Cincinnati Review, among other publications, and his fiction has twice appeared in The Best American Short Stories. He lives with his wife and four children in Lenox, Massachusetts, and teaches at Bard College at Simon's Rock.